Heinrich Hölzer (also Henry Helser and Henry Helzer) was born January 17, 1844 in Norka, Russia, the son of Georg Hölzer (born 1814) and Magdalena Nagel (born 1818). Heinrich married Christina Ross on January 12, 1865 in Norka. Christina was born in Norka on May 1, 1843, the daughter of Ludwig Georg Ross (born 1816) and Katharina Elisabeth Glanz (born 1818). Christina's father died tragically in 1852 from suffocation caused by a concentration of fumes inside a windmill in Norka. Heinrich and Christina became the parents of seven children born in Norka, three of whom died in early childhood: Johann Georg (born 28 Oct 1865 - died 25 Aug 18690; Peter (born 24 Jul 1867 - died 26 Nov 1867); Heinrich (born 10 Sep 1868); Magdalena (born 2 Sep 1870); unnamed child (born 11 Mar 1873 - died the same day); Christina (born 10 Mar 1874); and, Peter (born 22 Mar 1876). Heinrich, Christina and their four surviving children departed from Norka in 1876 bound for America. They arrived in New York on July 8, 1876 aboard the steamship Oder which sailed from Bremen, Germany. The Hölzer's were among a group of 85 families (mostly from Norka) who had traveled together from Saratov, Russia. Like earlier Volga German pioneers who arrived in 1875, most of this group chose to settle near Sutton, Nebraska. The Burlington & Missouri River Railroad established an immigrant house in Henderson, Nebraska (north of Sutton) in 1874. Another immigrant house was built in Sutton in 1875. The immigrant houses served as a place for new settlers to stay until they were ready to move onto their land claims. At the urging of railroad agents and a Black Sea German immigrant named Johannes Grosshans, who had settled near Sutton in 1873, a group of 35 Mennonite families settled at the Henderson immigrant house in October 1874. When the Helser family arrived in Sutton two years later, they chose to live in the newly established Mennonite Brethren community which had a large central house surrounded by cottages. An 1880 map shows this as a Mennonite Baptist Church. It was in this place that Heinrich adopted the Mennonite faith and became an ordained minister. The 1880 U.S. Census shows Henry and Christina living in the Lincoln Precinct of Clay County, Nebraska and Henry is working as a farmer. The family lived on a farm one mile east of Eldorado, Nebraska (near Henderson). Christina's brother, George Ross, lived on another farm nearby. The Helser's later moved to Hastings. Five children were born in Nebraska: Emma, Marnell, John, Peter, and Georg. 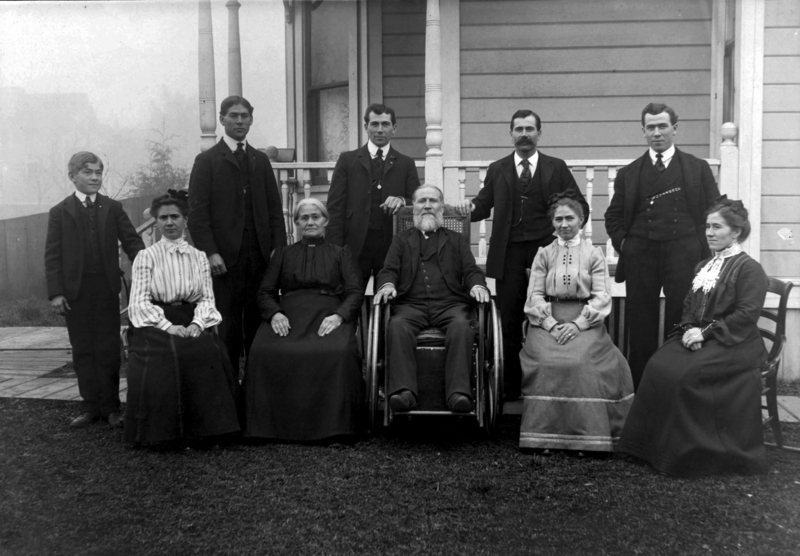 Photograph of Heinrich Helzer (seated in the wheelchair) next to his wife Christina (née Ross). Standing from left to right: 1. George Samuel, b. 28 Nov. 1888 Hastings, NE - d. 12 Jan 1965, Beaverton, OR 2. John Charles b. 12 Sept. 1881 Hastings NE - d. 21 Feb. 1929, Portland, OR 3. Marnell Jack b.1 Jan. 1880 Hasting, NE d. 17 April 1961, Portland, OR 4. Heinrich (Henry) b. 27 Sept 1868 Norka, Saratov, Russia d. 29 Sept 1936 Portland, OR 5. Peter Fredrick b. 14 Aug. 1883 Hasting, NE d. 1945 Green Acres, WA. Sitting from left to right: 6. Emma b. 16 Sept 1876 Norka, Russia d. 1959 7. Christina (Mother) b. 1 May 1843 Norka, Russia d. 16 Oct 1911 Portland, OR 8. Heinrich (Henry) H. Sr. (Father) b. 17 Jan 1844 Norka, Russia, d. 30 Mar. 1904 Portland, OR 9. Magdalene (Lena) b. 1 Sept 1870 Norka, Russia d. 16 Nov. 1942, Portland, OR 10. Christine b. 10 March 1873 Norka, Russia, d. 2 May 1927. The photo was taken in 1900 at the home of Heinrich and Christina. Photograph and description contributed by Loretta Woodward and Marna Helser Hing. Heinrich and Christina arrived in Portland in November of 1891 (Note: Lillian Ross-Brehm gives 1889 as the year of arrival in Oregon). The Helser's were part of a large group of immigrants from Norka that settled in Portland's Albina neighborhood. The 1892 Portland City Directory recorded the Helser family (listed as Hilzer and Hilser) residing on Union Avenue (now MLK Blvd.) between Knott and Sellwood (now Graham Avenue). Henry is listed as laborer and Emma is listed as a domestic. The 1896 Portland City Directory lists Rev. Heinrich Helzer as the pastor of the First United Mennonite Baptist Church. His residence at that time was 413 Russell (now 533 NE Russell Street). The 1900 Portland City Directory lists Rev. Heinrich Hilser [sic] as pastor of the First United Mennonite Church located on the northeast corner of Knott and Union. The 1901-1902 Oregon, Washington and Alaska gazetteer and business directory lists Henry Hilser [sic] as a Baptist clergyman in Portland, Oregon. The sons of Heinrich and Christina Helzer, John Charles and George Samuel, founded Helser Bros. Transfer Company in 1902. Heinrich died on March 30, 1904 and was buried at the Columbian Cemetery in Portland. Christina died on October 16, 1911 and her funeral service was held at the Second German Baptist Church. She was buried with Heinrich at the Columbian Cemetery. 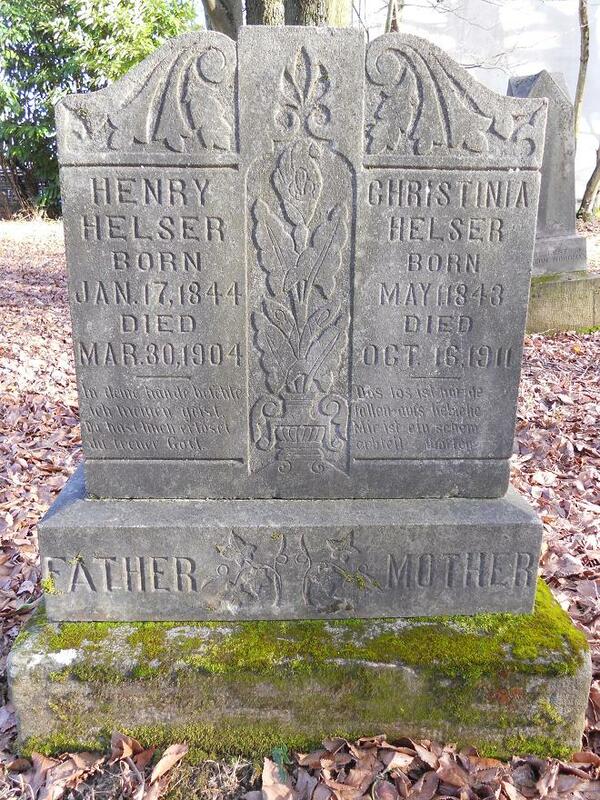 Tombstone of Henry and Christina Helser at the Columbian Cemetery. The inscription for Henry reads: "In deine hände befehle ich meinen geist; du hast mich erlöst, du treuer Gott." This roughly translates to: "Into your hands I commit my spirit: thou hast redeemed me, O faithful God." "Mennonite History." Henderson Heritage. Henderson Heritage & Tourism, 24 Aug. 2005. Web. 08 Sept. 2015. <https://hendersonheritage.wordpress.com/history/mennonite-history/>. Griess, James R. "So, Where Did All Those Griesses Come From, Anyhow?" Sutton Nebraska Museum. Sutton Historical Society, 26 Dec. 2013. Web. 9 Sept. 2015. <http://suttonhistoricalsociety.blogspot.com/2013_12_01_archive.html>. Griess, James R. The German Russians: Those Who Came to Sutton. Malcolm, NE: J.R. Griess, 2008. Print. Ross-Brehm, Lillian. Diary written on March 18, 1934. She states that Heinrich Hölzer and his wife Christina Ross came to Portland in 1889. Woodward, Loretta. Great-granddaughter of Heinrich Hölzer. Email correspondence.